Yes, it can be done! 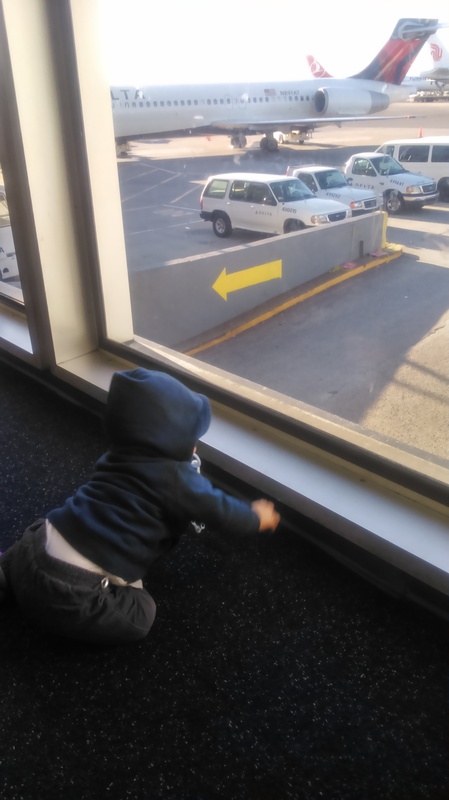 Back in June I traveled alone with my 4-month old son from Madrid to Boston on a direct flight. Since he was so little, he slept for most of the trip, but I said that in the future I would only travel when there were direct flights. However…due to a family emergency this all changed. I was dreading the 15 hour total trip alone with my 10-month old son, with a layover in NYC (JFK airport), but it turned out to be better than I was expecting. 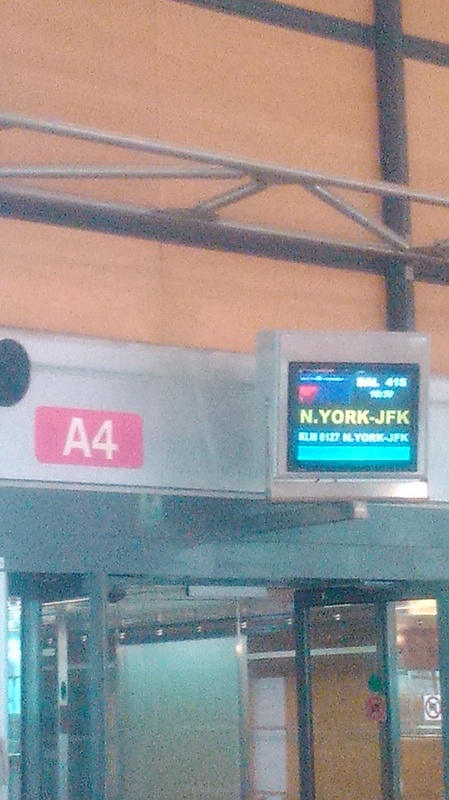 Probably the worst part was sitting there staring at the clock countdown with the little image of the plane on the screen in front of me during the 7 hour 25 minute flight from Madrid to New York. 1. Try to avoid making the trip until your baby can sit up on his own. There were many times during the trip when I had to put the little guy on the floor. 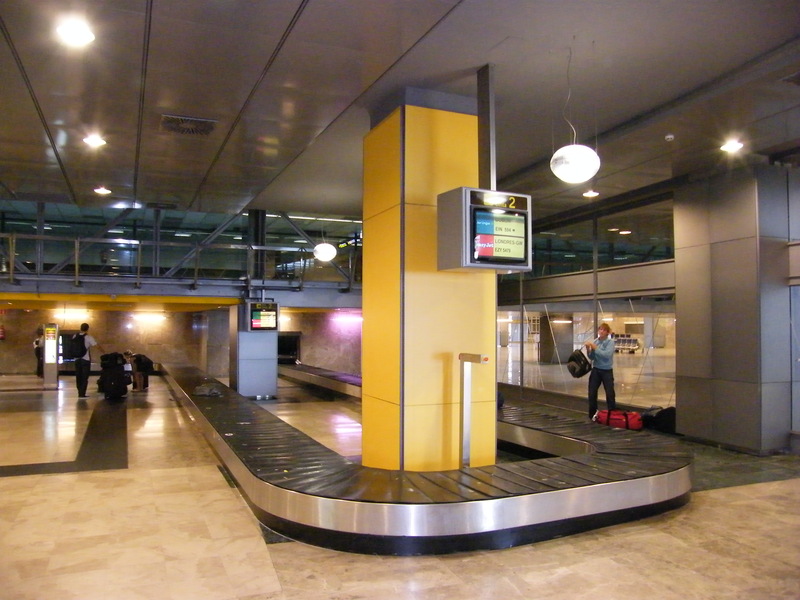 The first time was going through security in Madrid Barajas. The security personnel are not allowed to hold your baby nor can they help you fold up your stroller (especially when it’s a complicated UppaBaby like mine). It’s impossible to fold that up while you have a 10-month old in your arms, so I put him in a little playpen that they had set up at the security area and let him play for a minute while I got our bags, stroller, his food, etc. through security. Right before getting on the plane once again you have to fold up the stroller so you can leave it at the door. And once again the little guy was put on the floor for a minute. And going to the bathroom is another challenge. When he was 4 months old I could put him in the Baby Bjorn backpack, but at 10 months and 25 lbs sitting up is the only way to go. 2. Get to the airport early and ask everything 3 times. We departed from Terminal 1 in Madrid (not the huge international Terminal 4 with a satellite terminal and underground shuttle train), so this made the transit time a little easier. In any case, I would recommend getting there between 2 1/2-3 hours before your flight. Since I had bought the ticket last minute I had to pay for the infant ticket at the airport counter (not at the check-in desk like I was told on the phone). There wasn’t any line, but this whole process of the woman processing the infant ticket and getting it printed took almost a half hour. 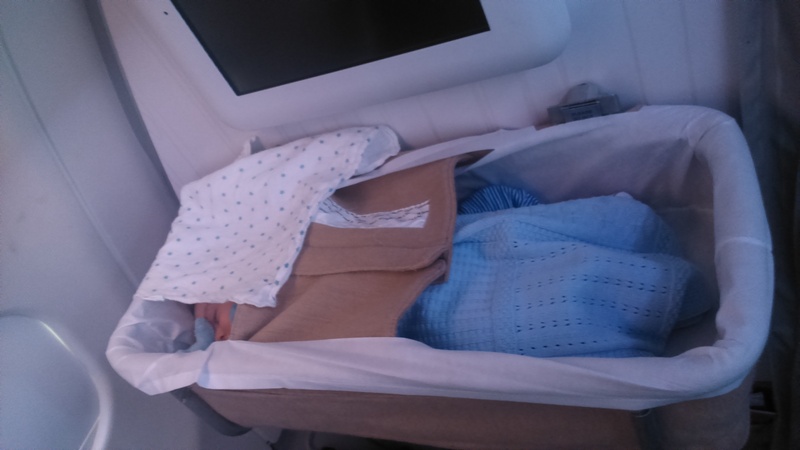 When I purchased the ticket over the phone (calling the toll-free US number while in Madrid) I specifically requested a baby bassinet for the flight and was guaranteed this without any problem. I also specifically asked if I would have to go through security again in New York as security is a real pain in general with a baby and also to know whether I could buy water for the trip. I was guaranteed again that I would not have to go through security and that I would arrive at gate B30 and depart from gate B32. I would only have to pick up my bags and go through customs (no big deal). Don’t believe anything you’re guaranteed with the trip and the flight. If it doesn’t go according to what you were told protest. Why do I say this? Keep reading. When I got on the plane, I found that I was in a window seat with a person right next to me, and no baby bassinet in front of me… the baby bassinet space seemed to be in the same row, but a few seats over. I happily realized this as the pilot was announcing that it was a full flight while people were boarding. 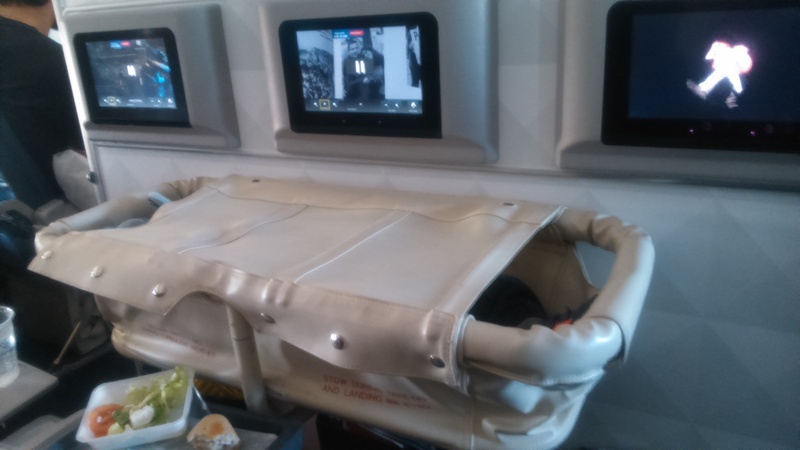 After asking the flight attendant about this and saying that I had been guaranteed a seat with the baby bassinet I was told that she was sorry, but that it was a full flight and there was nothing that could be done. She even asked me if I wanted to reschedule to a later flight as I had my 10 month old sitting in my arms. To this I replied that I was going home for a family emergency and never would have bought the ticket if I were not going to have a baby bassinet. Ten hours with a 10 month old in your arms in a little window seat was not going to happen…Fortunately a young girl who was traveling with her younger brother and sister switched seats with me so I was able to have the baby bassinet. And I definitely used it a few times! When I landed in JFK I went through customs and followed signs to connecting flights, only to find that I was being redirected to go through security with all new passengers again. Even after asking both over the phone with Delta and at the check-in counter at Madrid and being guaranteed that I would not have to go through security again, as it turns out I did. At this point there was really nothing I could do about it and nothing that protesting could help, but I was at least not made to throw out 3 bottles of water and a hot thermos that I had purchased as I said that I had specifically bought this to make baby formula. Thank goodness for little things. 3. Take your time through security and let people help you. Going through security is usually where I get the most nervous as you have people rushing you and a million things that have to be taken off, taken out, then put back in and put back on. And add a little baby, a stroller, and baby food to it and you might as well add a partridge in a pear tree… my advice is to take your time. Most security areas have separate lines for people with babies, wheelchairs, etc. They won’t rush you, but you’ll still have to take off all belts, take out any liquids, etc. The most important thing is to take your time and make sure you keep an eye on all of your belongings (and your baby). Your little one will have to take off his coat too if he’s wearing a jacket. And if you’re traveling with cans of baby food and/or formula, you may have to have them tested in special machines. It doesn’t hurt, but it does add quite a bit of extra time to the whole trip process. I had several people offer to help me to hold my son while going through security and on the plane. The only time I actually took someone up on this offer was at the second security checkpoint in JFK when I had to fold up the stroller to go through security and really didn’t have anywhere to put my baby, and right before getting on the second plane to my final destination when I had to fold up the stroller again. I let two people hold him for about 20 seconds, and it definitely helped. 4. Prepare any food that’s possible for you and your baby ahead of time. As for you, don’t expect to be able to eat the meal they serve you on the flight…bring along a few sandwiches and snacks for when the little one decides to take a nap. As for the little one, bring single meal servings (fruit/veggie and meat jars) so that you don’t have to worry about preparing anything and put pre-measured formula in the plastic dispensers. Whenever you get a chance during the long flight fill up a thermos with boiling hot water that you can later mix whenever you need with cold or room-temperature water that you buy in the airport before the flight. Trust me; this is definitely helpful when all of a sudden your baby decides he/she is starving! 5. Take the little one out to play before the first flight and during the layover. I brought along a small roll-up towel that I put on the floor so my baby could play a bit before the first long flight and during our 2 hour layover. Once you’re on the plane he can’t move around much, so it’s best to let him get out as much energy playing as possible beforehand. 6. There’s no easy way around jetlag, but trying to get food on a normal schedule asap helps. When traveling from Europe to the US expect to get up pretty early the first few nights and/or week until your baby gets used to the schedule. I remember the first night hearing my little one ready to play at 2am (8am his normal time). The only thing you can really do is play a little, but keep the lights off and the room dark. They should fall back to sleep a few times, so you can not really get up until close to their normal wake-up time. During the day, if they’re tired, let them sleep. However, when you notice that the late afternoon nap is turning into a nighttime sleep mode you’ll have to wake them up to avoid them sleeping 10 hours straight and waking up at 2 or 3am. 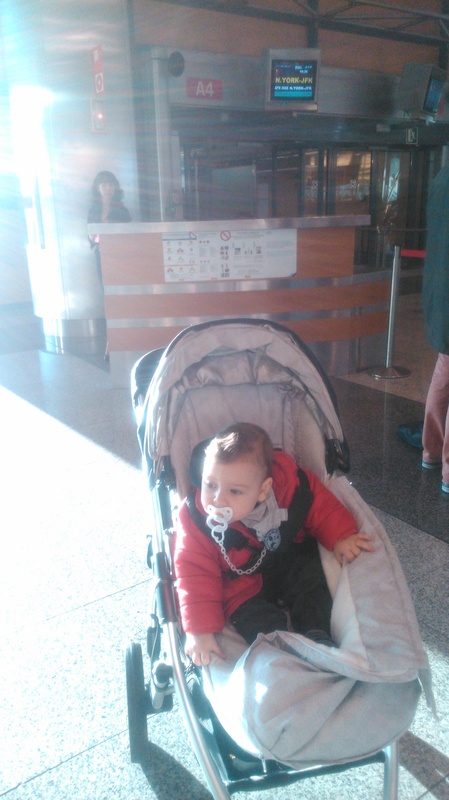 This entry was posted in Customer Experience, Travel and tagged Iberia, International Travel with Infants on December 25, 2014 by Michelle. I don’t have a second last name and my middle name is not my first last name. If I had a nickel for every time there’s been a confusion with my middle/last name (like not being able to find my medical records when I’m going to have a baby…) let’s just say that I’d be pretty well-off. I completely understand that here in Spain everyone has two last names (first the father’s and second the mother’s), and I understand that this can be confusing. However, not everyone living here (and paying taxes here I might add. Somehow the agency collecting my taxes didn’t get this wrong) is from Spain. I can see how this could be confusing the other way around in the US, classifying a first last name as a middle name, but I think the key is to be clear and specific whenever signing up for anything. I tend to specifically state (and make a joke about it) to whoever it may be handling my paperwork when I’m signing up for something for the first time that I only have one last name. Despite this, I still constantly find it classified incorrectly. This has happened with all types of documents: bank accounts, hospital documents, health insurance cards, NIE (Spanish residency card), you name it. In another instance I was picking up hospital records while pregnant only to be told they had no records for me. Yep, turns out everything was filed under my middle name. If you have a baby here, make sure they put your child’s last name with your last name and not you middle name as a last name! Right after giving birth, as dazed and confused as I was, I asked this to the people with paperwork right there in the delivery room! There have been a few times where I’ve been trying to fill out an online form and there’s an obligatory “Segundo apellido” field. 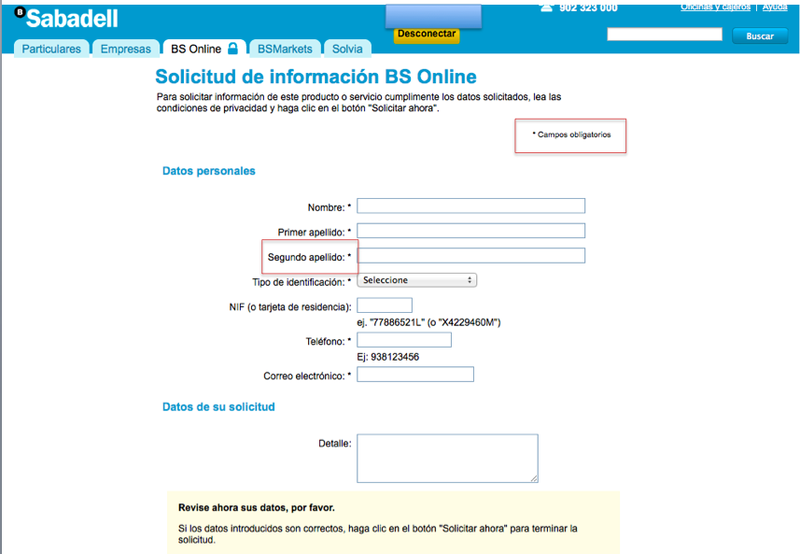 BancSabadell, for example, has this on their web contact form when you’re already logged into your client account. I don’t think I’m the only foreign client…here’s what I put in this field (in Spanish obviously) “I don’t have a second last name, and this should not be an obligatory field.” Of course when I finally got a response a few days later to my request this part was ignored. My advice: apart from specifically stating that you only have one last name, make sure you double check any and all documents before signing anything. This entry was posted in Miscellaneous and tagged Last names Spain, Two last names on December 17, 2014 by Michelle. Loudly chewing gum in your customer’s face. This is a classic customer-facing no-no. I was happy when the woman decided to get rid of the gum, but I don’t know if spitting it out in a piece of paper in front of me was quite appropriate either. Continuously yelling across the branch to another employee. All I have to say is that if I were the customer they were talking about, I wouldn’t be so thrilled at my confidentiality. Checking your phone messages, laughing and writing back to whatsapps while the customer is sitting in front of you. No comment necessary. Assuming personal details without any reason. The topic came up that I had been recently laid off (that was the extent of what I said). What I’m not sure of is how or why the woman felt it was right to say “You were an English teacher, right?” To which I responded back, “No, I was working for five years in marketing at a multinational consumer goods company.” I thought that would end the line of ignorant questioning. However… then the next question was “So you’re not going to go back home?”. To which I politely responded, “Well, since I’ve been here almost nine years now and have my husband and baby here, I don’t think so.” And that was the end of that. I should have asked her where she learned flamenco. Assuming I don’t understand a legal contract. After handing me the new account contract to sign, as I started to read it, the woman quickly told me that I just had to go to the last page to sign it (assuming I didn’t understand that I had to sign at the end). I said thanks, I know, but I always read things before signing them. Not knowing how your products work cross-channel. After opening up the account I asked if I could make transfers between the new account and my old one to which the woman responded that she had no idea, but that I should try it out later at home and see. Overall a good attitude is the most important thing, and the woman helping me was nice, but a few quick fixes could go a long way to the overall experience here. This entry was posted in Banks, Customer Experience and tagged Banks Spain, BBVA, Customer Experience on December 16, 2014 by Michelle. 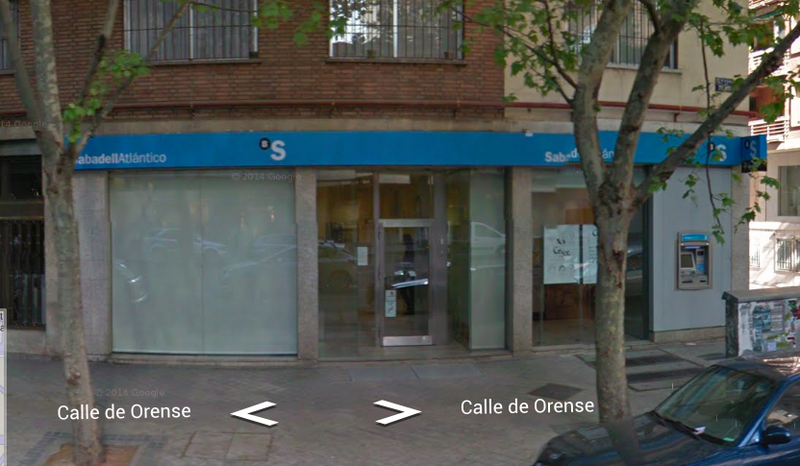 First interaction (not-even-close-to-good) Not too long ago I went to the BancSabadell branch on Calle Orense (Madrid) to conduct the simple transaction of depositing cash in my account. Now you might be wondering why this even deserves a post, but you’ll soon find out. When I entered the branch there was one person in front of me and another currently being helped. There were two tellers at the main desk (or so it appeared): one to the right who was dealing with the current customer, and a woman to the left with a plaque in front of her reading “Servicio al cliente” who seemed busy on her computer, but without any customers. Now, even if you don’t speak Spanish you can probably tell that this means Client Service. The woman sitting behind this sign seemed to be completely oblivious to the fact that there was a line of people waiting to be helped. The person in front of me moved forward, and I promptly moved to the “Servicio al cliente” woman and asked if she could help me. She looked up, gave me an obviously annoyed look and in a rude tone stated that no, I had to wait in the other line to be helped. I said ok, I’m just surprised because it says “Servicio al cliente” right here. She quickly retaliated and said “No, this is a work desk. Go back and wait in that line. “ She then returned to her computer screen. Now, after many years in Spain I’ve gotten used to the service, but could not believe the blatant rudeness and comic element here with the plaque in front of this woman. In the past I would not have said anything, but this time after the other teller (who was also quite unpleasant with me likely because she heard my conversation with the other teller) finished with my deposit, I said I’d like to speak to the manager. Her response was that the manager was not there and she did not know when he would be back. I asked for his name, which she did give to me, but to actually make the effort to go back to the branch at another point to try to talk to someone who likely would treat me in a similar manner was enough for me to just leave in an angry mood and bitter at BancSabadell. Note to BancSabadell: the customer-facing part of your business and the daily interactions that your employees have with your customers are critical! An experience like this will not leave a customer feeling eager to invest in any other products at your bank. Any employee who is client-facing (literally) and especially one with a “Client Service” sign in front of them should be prepared to treat customers with respect and a smile! Just the other day I walked into the same branch where I had had the wonderful customer service experience earlier detailed. This time I was going for a more “difficult” request, as I was interested in running a loan payoff simulation. Instead of going to the tellers, I immediately walked into one of the private customer areas and interrupted a woman who was busy at her desk to ask if she could help me. She immediately looked up, smiled and said that of course she could help me. And she did just that, with a smile. Unfortunately the interaction that stands out in my head and that receives a few paragraphs compared to this last interaction is the negative one. This entry was posted in Banks, Customer Experience and tagged BancSabadell, Banks Spain, Customer Experience on December 16, 2014 by Michelle.